Explore the hills and forests of New Jersey with Kayak East! When the waters are too cold for paddling it's a great time to lace up those hiking shoes and go for a walk in the woods! 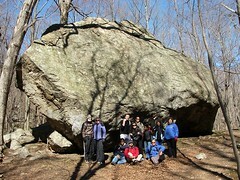 New Jersey has a great assortment of trails ranging from easy flat walks to steep rocky climbs. Natural wonders, rich cultural history and heritage, wildlife and beautifully scenic vistas await for those willing to seek them out. Join us as we hike different areas and explore the bounty that the state has to offer. Explore the hills and forests of NJ with Kayak East! When snow falls we'll supply the snowshoes for a guided snowshoe tour. The trails are especially beautiful after a snowfall and we'll travel with ease over soft snow for a day you will surely enjoy. A great way to stay in shape over the winter months and invigorate the soul. 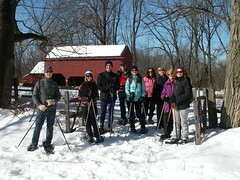 Private Snowshoeing Hikes are available for 4 - 10 people. Contact us for more information. E = Easy - Expect mostly flat and smooth walking paths around 5 miles in length. M = Moderate - Expect some hills, rockier paths and/or longer distances. S = Strenuous - Expect very steep and/or rocky trails. Also rated as strenuous if length of trip exceeds 10 miles.